Dimensions: 13.5" x 13.5" x 2"
His joy and excitment brings me to tears. In talking with a neighbor and his daughter, I found out he loved sudoku, and she word games, she was intimadated by numbers. They spent their time playing thir games. Great fun to play alone or with a group! You can sit down by yourself or play with several others. It is a game that people can come and go. Even my grandkids, ages 11 & 13 loved to sit and play. Quite a few that sat down to enjoy the game had never played Sudoku. It's a big hit. Thanks for designing such a fun game. I thought it was really neat. It looked nice. As it was a gift, I can't say too much, but I was very pleased with the quality and appearance. Erasing is an inevitable part of Sudoku… or is it? Dr. Mark Asperheim was tired of repeatedly scribbling and erasing to finish newsprint Sudoku puzzles, and he imagined a more colorful option. Mark started brainstorming with his partner, Cris Van Oosterum, and the two founded Mad Cave Bird Games to bring their vision to life. 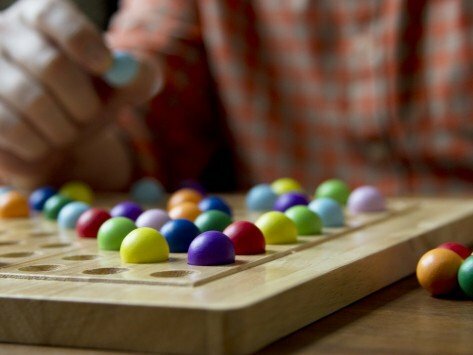 ColorKu uses wooden marbles instead of numbers to solve puzzles. Like Sudoku, the object of ColorKu is to fill a 9x9 grid so that every row and column has nine different colored marbles with no repeats, and each 3x3 grid also has nine different colored marbles with no repeats. The marbles make it easy for players to move the colors around, trying different combinations without constantly erasing. The ColorKu set includes 81 balls in nine different colors, 104 puzzle cards, solutions booklet, color conversion card and storage tray. If you want to add a colorful dimension to family game night, Colorku is ready to play.